The Mayo Clinic Robert D. and Patricia E. Kern Center for the Science of Health Care Delivery has a booth (#211) at the AcademyHealth Annual Research Meeting June 25-28 in Boston. If you happen to be there, stop by for a visit. You'll be able to learn more about all kinds of health services research going on at Mayo Clinic, although this year much of the conversation will revolve around epidemiology and population health. We'll be sharing some information about the Rochester Epidemiology Project too, which is celebrating 50 years of continuous National Institutes of Health funding this year. Lots of potential research projects in this unique national resource, which has led to more than 2,600 publications thus far. 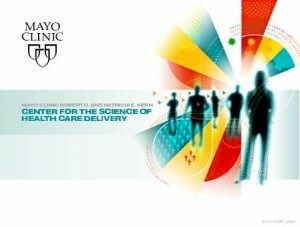 Mayo Clinic has an impressive lineup of presentations, posters and panelists throughoutthe program as well. A few highlights below, otherwise check out the program online. Meet-the-Experts Student Breakfast - Elizabeth Habermann, Ph.D., is our expert in the group. Risk Prediction: Leveraging Longintudinal Data for Population Health (abstract discussion session) - Predicting Change in Glycemic Control Among Previously Controlled Type 2 Diabetes Patients Using Longitudinal Data: A Machine Learning Approach, Che Ngufor, Ph.D. Using Big Data to Assess Care and Outcomes for Individuals with Complex Chronic Conditions (abstract discussion session) - Trajectories of Glycemic Change in a National Cohort of Adults With Previously Controlled Type 2 Diabetes, Rozalina McCoy, M.D. How do Family Caregiver Support Policies Impact Patients, Caregivers and Health Systems? Evidence from the Partnered Evaluation of the VA Caregiver Support Program (panel discussion) - Joan Griffin, Ph.D.
Look us up. If you're not at the event, consider watching the Twitter hashtag (#ARM16) for ongoing activities - including highlights from the program that feature Mayo Clinic research. Congratulations on the success of the research meeting. Hope there will be research meetings on drug test models devleoped by 3D cell Culture or other methods held by authoritative organizations like Mayo.